I know, I hate the weather talk, but it was pretty much a dominating factor all weekend. Friday was gorgeous, bright, sunny and warm. Downright balmy even after sunset, and the complete opposite of Saturday, which was doom and gloom all day. I got my obligatory strawberry shortcake at my town's annual festival, then headed home and hoped the rain would stop before the evening. It didn't, and I had a wet walk to Toad's Place in New Haven, where I went to see "The Kooks". It was a fun show and it's been far too long since I've been to a concert. I'm happy to see more venus popping up in my area, but there still isn't much draw for bigger names to bother stopping in Connecticut, so I'm always delighted when a band I recognize plays New Haven. Sunday was even more ridiculous, weather-wise. The rain carried over through the morning, but by noon the sun was so strong you could have forgotten the rain ever even happened. My Sister and I took our Dad to check out the new brewery that opened down the road from us; instead of offering food service they have food trucks outside, we had a fancy pear and gorgonzola wood fired pizza. Then, just when it seemed like we were going to enjoy a beautiful sunset of the summer solstice, it started to rain again... oh New England, what am I going to do with you? Loving all your jewelry in this outfit, as per usual, haha. And yea, this weekend was so annoying! Stupid weather being yucky! And now today is supposed to be perfect....blegh! 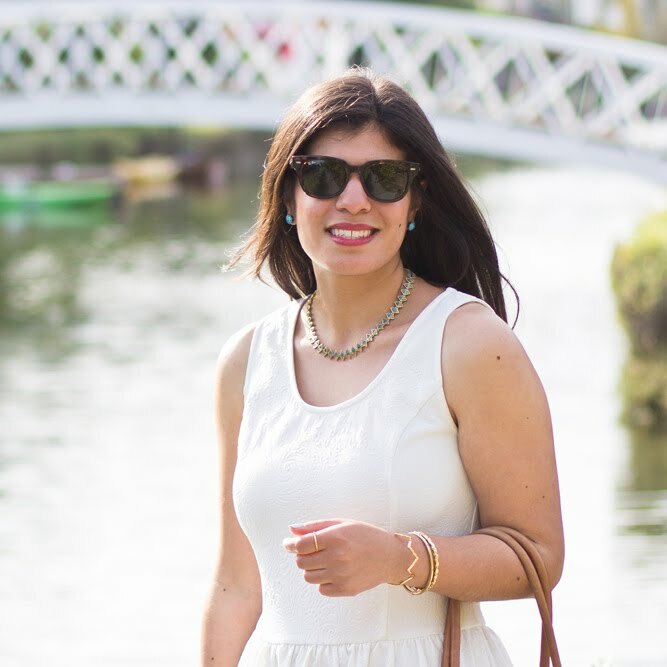 Early summer weather is all over the place, but you have got the classic summer look down! 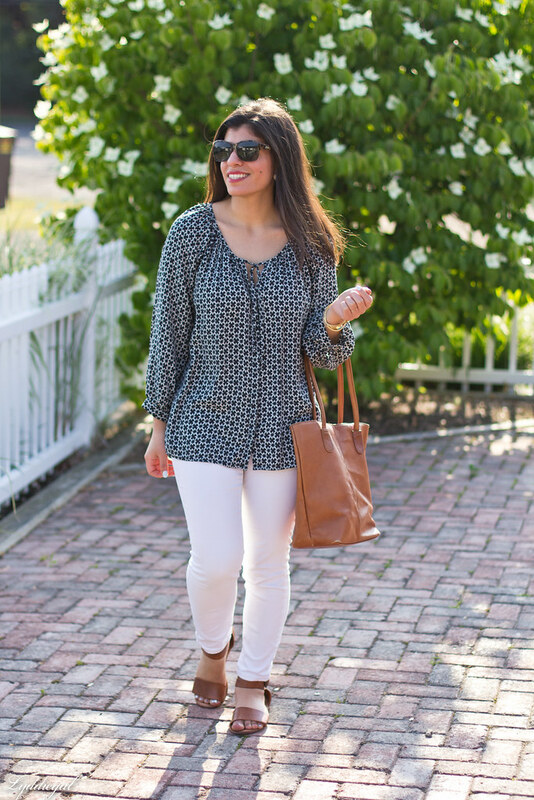 White jeans are a summer staple and your cognac accessories are perfect! What strange weather! At least you managed to get some lovely outfit shots before the rain came back. 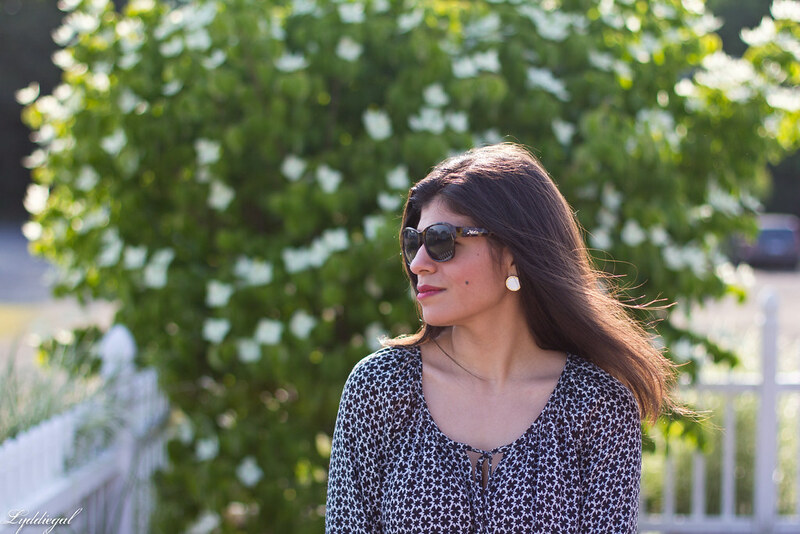 We've been pretty lucky with our summer weather so far - touch wood - with very few days of rain and it has made my outfit photo life much easier. (Although I admit I'm definitely less motivated to take outfit photos when I could be lounging by the pool instead!) All that weather talk aside, this outfit is the kind of outfit that just screams summer to me - white jeans, a flow tunic and cognac accessories. You look perfectly put together but also totally comfortable and at ease. And what more can we ask from summer style? I hope things stabilize a bit for you. And how weird is it that I had totally forgotten about Toad's until I read this? Sounds like a bipolar weather weekend but amazing none the less. 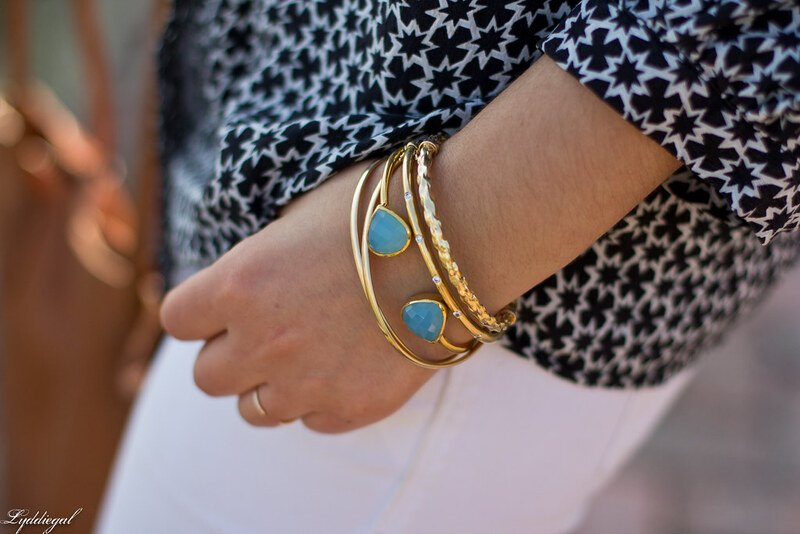 Adoring all your gold accessories. So gorgeous and loving your top! Ha, that sounds like our weather lately, although this weekend we actually had a little break from the rain. 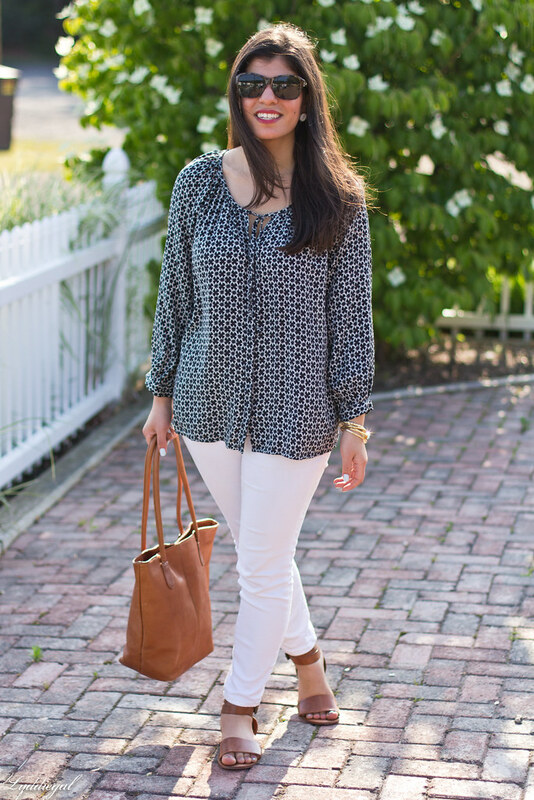 I love the pretty print of that blouse! And mmmm, short cake! That pear pizza sounds delicious! We got lucky and didn't have any rain yesterday. It was actually quite sunny and hot here once the skies cleared! I'm loving that print on your top! and those earrings are so pretty! you look so chic and fresh and relaxed. 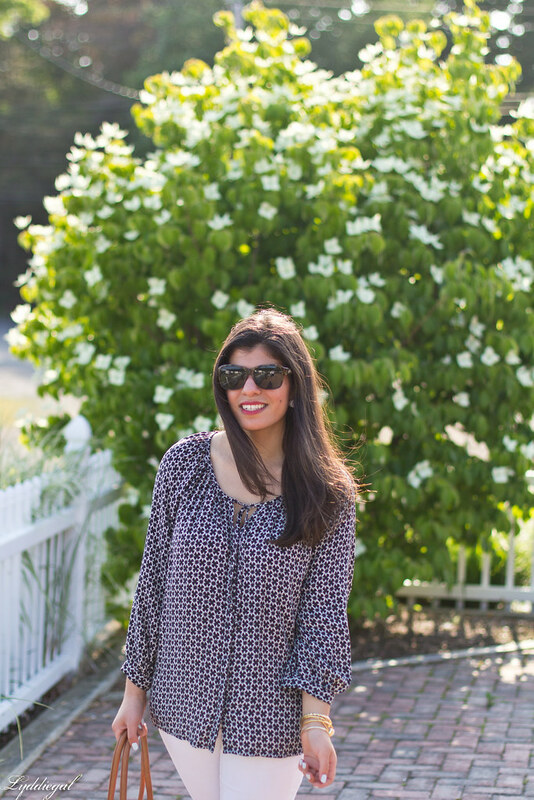 Loving this breezy tunic. Such a cute top! And I love those bracelets! Oh, I wish I had the chance to go to a concert! I love your top, by the way, it's so fun what with all the prints and all! This is such a perfect chic casual look. Sounds like a good time despite the fickle weather. This is so beautiful, I love this outfit!!!! perfect for summer!!! I was so not happy about the weather on Saturday...totally ruined our anniversary plans! You look adorable, I love that top! This outfit is really flattering on you! Yup, the weather is crazy this year! Also, I love that tunic on you, sweetie. Sometimes I feel like the weather never cooperates! 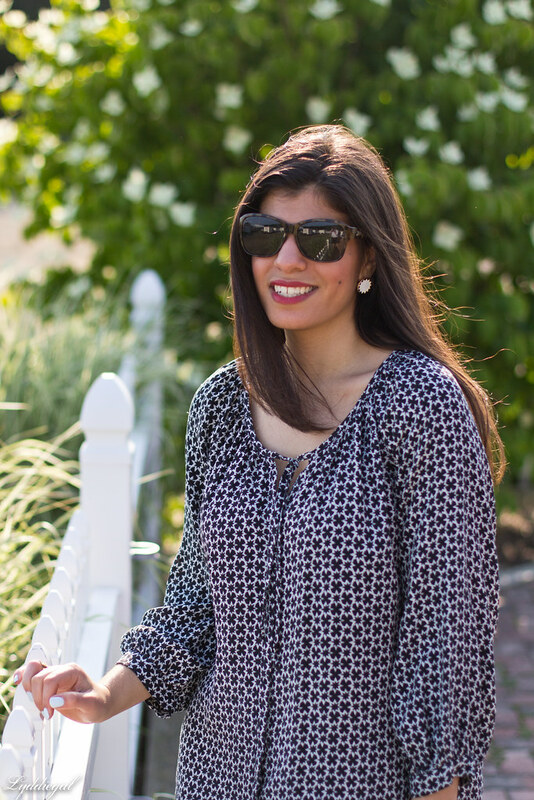 Love that gorgeous tunic on you! Pear and gorgonzola... oh Lydia, you're a girl after my heart. That sounds incredible. 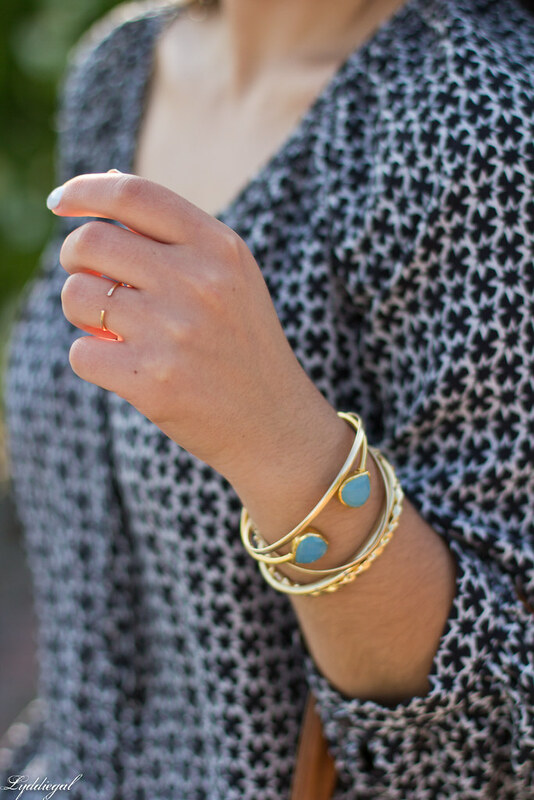 I adore that simple gold ring--it's so charming! Love the entire look! Especially that arm candy!